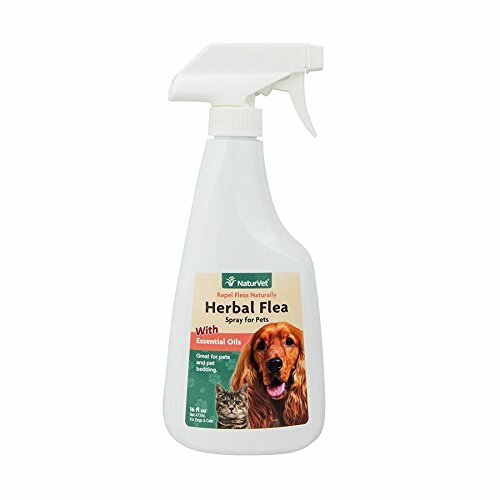 NaturVet Herbal Flea Spray With Essential Oils Repels Fleas Naturally while Deodorizing with a Fresh Herbal Fragrance. The Unique Combination of Rosemary , White Thyme, Lemongrass and Cedarwood Oil Repels Fleas. Safe to Use Directly on Pet and Perfect for any Type of Pet Bedding, Such as Pillows, Foam Beds, Blankets and Cat Condos. Liquid 16 fl oz. for External Use on Dogs and Cats After Weaning and Over the Age of Six Weeks. Shake Well and Spray a Light Coverage on Your Pet From a Distance of 6 to 8 inches, for Best Results, Ruffle the Coat While Lightly Spraying Against the Natural Lay of the Hair. Cover Pet's Eyes and Nose with Hand, with a Fast Stroke Lightly Spray Head, Ears and Chest. With a Cloth, Rub into Face Around Mouth, Nose and Eyes, then Lightly Spray the Neck, Middle and Hindquarters, Finishing with Legs and Tail Last. Do not Saturate and Avoid Contact with your Pet's Eyes, can be used as Often as Needed. Active Ingredients: Sodium Lauryl Sulfate, Lemongrass Oil, Rosemary Oil, Cedarwood Oil and White Thyme Oil. All NaturVet Products are Veterinarian Formulated and Manufactured in the USA in an FDA Audited, cGMP Compliant Facility with a 100% Satisfaction Guarantee. The unique natural combination of Rosemary, Cedarwood, Lemongrass and White Thyme oils repels fleas naturally while deodorizing with a fresh herbal fragrance. Safe to use directly on pet and perfect for any type of pet bedding, such as pillows, foam beds, blankets and cat condos. Liquid 16 fl oz. for external Use on Dogs and Cats after weaning and over the age of six weeks. Active Ingredients: Sodium Lauryl Sulfate, Lemongrass Oil, Rosemary Oil, Cedarwood Oil and White Thyme Oil. Shake well and spray a light coverage on your pet from a distance of 6 to 8 inches, for best results, ruffle the coat while lightly spraying against the natural lay of the hair. Cover pet's eyes and nose with hand, with a fast stroke lightly spray head, ears and chest. With a cloth, rub into face around mouth, nose and eyes. Then lightly spray the neck, middle and hindquarters, finishing with legs and tail last. Do not saturate and avoid contact with your pet's eyes. Can be used as often as needed. All NaturVet products are veterinarian formulated and manufactured in the USA in an FDA audited, cGMP compliant facility. View More In Dog Flea Sprays.